Guns N’ Roses fans have clamored for a reunion of the band’s classic lineup for decades, and now those dreams are finally coming partly true. According to an official press release, Slash and Duff McKagan are indeed returning to the band. There is no word as to who else will join those three for these performances, nor any word on any further touring or recording plans for the trio. Chatter surrounding a GNR reunion intensified in recent weeks, sparked by Slash’s surprising revelation that after years of enmity, he and bandleader Axl Rose had repaired their friendship. After years of baseless speculation, the latest round of rumors was initially easy to dismiss, but as details continued to leak — with even the New York Times jumping on the GNR reunion bandwagon — it became clear something was actually going on behind the scenes. 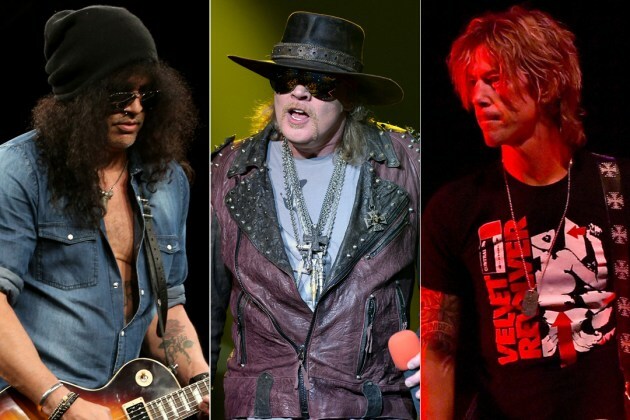 Slash and McKagan exited the band in 1993, deducting two crucial components from a lineup that had already weathered the departures of drummer Steven Adler and guitarist Izzy Stradlin. Rose continued with an overhauled lineup, and his former bandmates pursued solo careers — with Slash’s post-GNR output enjoying arguably the highest profile — but the calls for a reunion never stopped coming. While the rumors might have been just about constant, the likelihood of Rose reassembling the classic lineup — and reuniting with Slash in particular — seemed pretty minimal, especially after the disappointment surrounding the group’s induction into the Rock and Roll Hall of Fame. Rose refused to attend (and denounced the Hall in general) in an open letter, leaving an assortment of former members to perform with singer Myles Kennedy at the ceremony. The road to reunion was further paved by some key departures from Rose’s most recent GNR lineup, including the exits of guitarists Ron “Bumblefoot” Thal and DJ Ashba. With the group in flux, the timing was apparently right for an unexpected second act for our estranged former bandmates — and while it remains as impossible as ever to tell what might come next for Guns N’ Roses, it’ll be hard to top this announcement when it comes time to tally up 2016’s biggest classic rock news stories.